They emerged in the pneumatic void of 1971: V.U. has just split up, The Stooges has disbanded (they regrouped in london in 1973), the MC5 were exiliated in england. the New York Dolls were yet to come. In one of the most suicidal move in r’n’r history, Jonathan Richman turned his back to the two chord Sister Ray rip offs as Roadrunner, She Cracked and Pablo Picasso for the childish r’n’r of his forthcoming career. the “original” modern lovers finally broke in 1974. Former guitarist John Felice formed The Real Kids, Jerry Harrison joined The Talking Heads, Ernie Brooks had a brilliant session-man career (Elliott Murphy above all) and David Robinson later joined The Cars. they have made several aborted attempts to record an album. they left several brilliant sessions that surfaced early on. THEY DID MANAGE TO MAKE IT INTO THE STUDIO 6 DIFFERENT TIMES: 4 DEMO SESSIONS, AND TWO THAT WERE SUPPOSED TO PRODUCE AN LP. 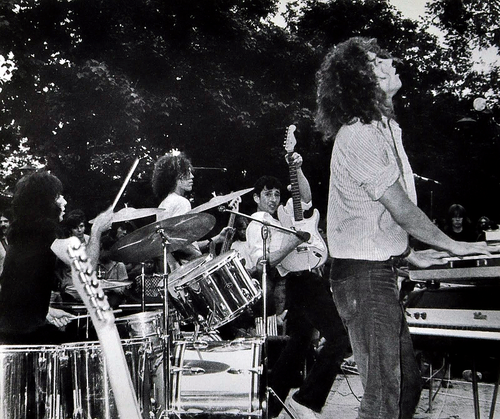 IN 1976 BESERKELEY RECORDS RELEASED THE FIRST SELF-TITLED MODERN LOVERS LP WHICH WAS BASED ON TWO DEMO SESSIONS FROM APRIL, 1972 AND SUBSEQUENT REISSUES HAVE ADDED ANOTHER BATCH OF TRACKS TO THE ORIGINAL. THEN IN THE EARLY 80’S GREG SHAW RELEASED AN LP CALLED THE ORIGINAL MODERN LOVERS WHICH WAS BASED ON TWO KIM FOWLEY SESSIONS: (1) SUMMER 1972; AND, (2) THE PUTATIVE LP SESSIONS FROM OCTOBER, 1973. The band’s first time in the studio (Boston september 1971) was at Intermedia, a relatively new (opened in December, 1970) state of the art studio, with 16 track capability. These demos were funded by Warner Brothers, who were already quite interested in the band. This is well before the Cale demos, and well before Lilian Roxon wrote her review which supposedly got the music world in such a frenzy over the band. Hospital made it to the Beserkely LP courtesy of Jerry Harrison’s copy of the tape (Warner Brothers has never had this in their tape library). Two other tracks were added to the 2007 reissue. This is the best quality version of Ride Down on the Highway. Nobody in the band remembers the exact date (or even the month) that these demos were recorded. Fall 1971 is the best guess. But, the tape box for the source reel says September, 1971, and that sounds about right. Warner Brothers and A&M brought the Modern Lovers out to LA in April, 1972 to record some demos at WHITNEY STUDIOS, GLENDALE CALIFORIA APRIL 26, 1972. The first session was produced by John Cale on an 8-track machine. A version of Dance With Me was also recorded but was never mixed down. I’m also pretty sure that a second version of Roadrunner was recorded, also apparently never mixed down. John Cale plays the mellotron on Girlfriend, and he also plays the piano on Pablo Picasso. Ernie Brooks plays guitar on that track and Jerry Harrison is playing the bass. Warners sold this material to Beserkeley, along with all the other material which they recorded. But, the original 8 track tapes still are in the Warners tape vault. The sound on the original tapes is quite different than on the LP. Matthew Kaufman did his best to eq Ernie Brooks out of existence on the LP. the original “mixes” are superior. to record this demo. Alan Mason worked for A&M records doing college radio promotion and he brought the Modern Lovers to the label. He also worked with Matthew Kaufman, who had a production company which released records through A&M. So, when A&M bailed, the two of them stepped into the breach and funded a short session at Clover Studios which apparently was owned by Robert Appere, who is listed as the engineer here. Kaufman, who is from Baltimore, had been courting the Modern Lovers prior to this so it’s not surprising that he got involved. the first Modern Lovers LP. days recording in his garage. Fowley then took the best material and headed out to LA to try and pitch it to record company execs. Some people have given the date of June for these demos, but once again, nobody is quite certain. Most of this was released in the early 1980’s on the original modern lovers lp on Mohawk/Bomp records, the Greg Shaw’s label. It’s not clear who exactly owns it, but the release was completely unauthorized, and it’s really nothing more than a bootleg. It feaures tracks at the wrong speed and what sounds like tape bleed through. My source has the same problems. Dinky Dawson has the original reels and there definitely was additional material recorded. After signing with Warners, in March, 1973, the Modern Lovers headed out to LA and arrived in early July to record an LP. Sessions didn’t get going until September, by which time the band’s relationship with Cale had deteriorated to such an extent that these sessions were abandoned after just a couple of days. According to the band, no tracks were completed. Backing tracks were in progress, possibly with guide vocals. If this material has survived it is now owned by Matthew Kaufman. When Cale bailed, Warners pulled Kim Fowley in to rescue the situation, although some who were involved still maintain that this was yet another demo session at GOLD STAR STUDIOS, LA OCTOBER 1973.
the source is labeled Kim Fowley worktape, and Roadrunner is followed by an additional track, Dignified and Old, which did NOT make it to the acetate. The band spent a couple of weeks and then at the end recorded literally every song in their repertoire, just to get them down on tape. They KNEW it was all over. two tracks originally appeared on a Warners compilation called Troublemakers. 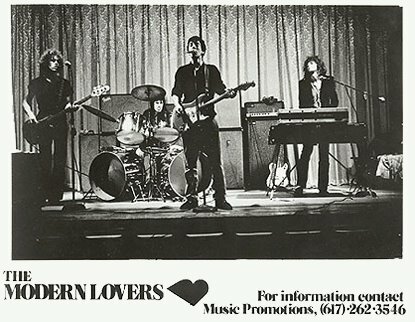 They were then added to a reissue of the Modern Lovers LP. Others showed up on the Original Modern Lovers LP. Completely illegal as the material is owned by Matthew Kaufman. EARLY MODERN LOVERS SONG WERE BRAVE, UNCOMPROMISING STANCES AGAINST THE STAGNATION OF EARLY SEVENTIES MUSIC CLIMATE. I’M STRAIGHT IS THE FIRST, ALTOUGH TONGUE IN CHeeCK, TIRADE AGAINST THE HIPPIE CULTURE (“HIPPIE JOHNNY IS ALWAYS STONED, I’M STRAIGHT AND WANT TO TAKE HIS PLACE”…). Jonathan Richman, despite the teenage angst and the confrontational garage rock rage he put into the performance, definetely cut off from any seventies rock standard. No drugs, no denim, no long haired. Instead crew cut and a sixties college outfit. They basically split because he refused to play those songs on stage anymore because he had the feeling at the time they could influence young people in the wrong direction. “I called up hospitals because i wanted to do something. I entartained those ‘retarded children and I realised they understtod me far better than the so-called unretarded people. If they liked you, you knew they liked you. And I realised that I wanted to get away from the direction my music was headed”.